Desktop computer have become popular among musicians, gamers, film buffs and YouTube stars. If you work with sound often, then youâll need to get one of these âbad boysâ as headsets may not always give you the sound experience you desire. 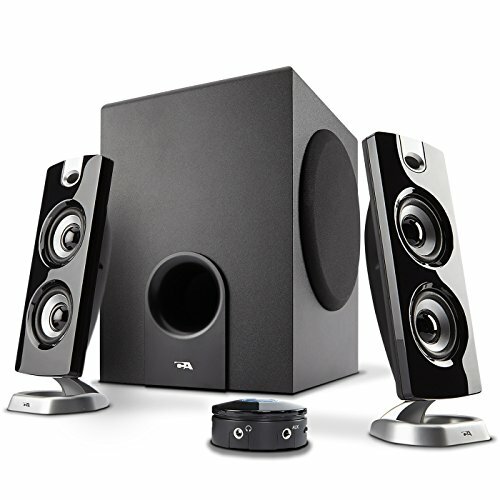 Selecting a good PC speaker can be difficult, when youâre on a budget can be difficult. There are lots of factors to consider, but weâve got your back. Check out these ten awesome devices weâve compiled for you. They are amazing options to consider if you do not want to cross the line between cool and expensive. The Creative Inspire T10 takes sound to a whole new level. Its elegant look and pristine audio make it a buyer favorite. It is a two-way speaker housed in a compact design; pretty cool right! Now, you wonât have to sacrifice performance for extra space. Talk about the specifications, The Creative Inspire T10 features a set of dedicated tweeters that make the details in the sound audible even high frequency instruments like strings and cymbals can be heard with clarity. The BasXPort technology is so cool; it delivers vivid bass effects that can match a speaker with a sub-woofer. 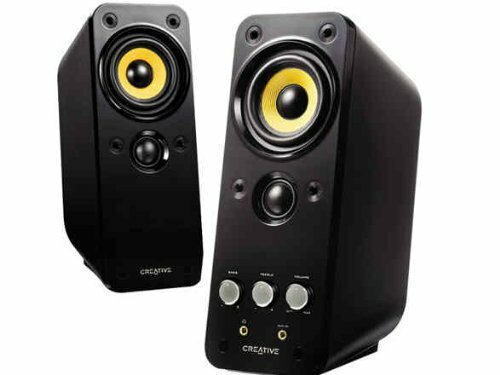 One of its manufacturersâs best selling three-piece speakers, The Cyber Acoustics 2.1 Computer Speakers with Subwoofer features bold, rich and powerful sound with clear highs and thunderous bass performance. It will amplify the sound effects of your computers, gaming system, iPods, Smartphoneâs and MP3 players. Housed in a sound-amplified wood cabinet is the subwoofer which delivers solid, clean and deep sound experience no matter what youâre listening to. It features a system control pod to switch the speaker on and off, this control pod also houses the headphone output jack and a 3.5mm auxiliary input for quick connection to devices. It is also equipped with an LED power indicator ring you can control the master and bass volumes of the subwoofer, with the turn of a finger. This bad boy is perfect for listening to music, watching movies and gaming. I get goose pimples thinking about these speakers, but who wouldnât? It is sleek, affordable and delivers high quality sound to complement your PCâs built-in speakers. This is a pretty awesome combination and perfect for gamers, and âYouTubersâ. The SonVerse is best of both worlds in terms of price quality. Itâs an impressive choice if youâre on a tight budget. 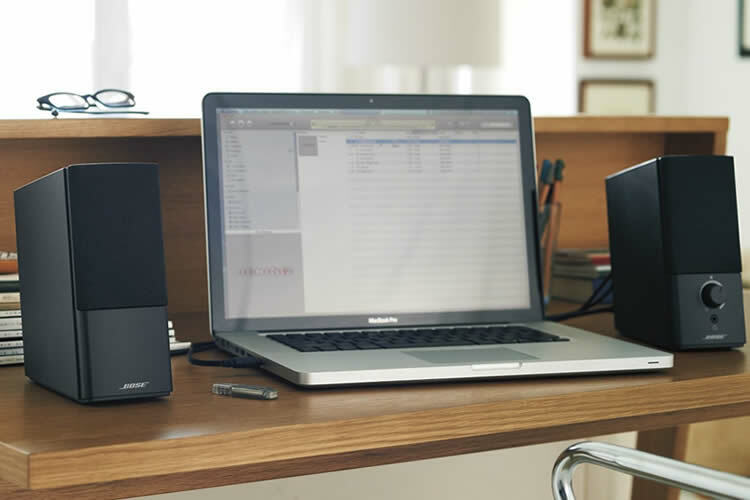 The Satechi Dual Sonic Speakers bring out the life in your computerâs audio. It is USB-powered with an âin-lineâ volume control. It features an Acoustic Air Spring technology which produces clear-cut sounds. Another amazing feature of this speaker is its ability to reproduce Bass, highs and mids incredibly. One goose-pimple inspiring feature of this machine is its elegant design. It features a sleek, modern polished metal finish with captivating blue LED accents and a padded base that wonât scratch your floor surfaces. Regardless of its features, this speaker isnât difficult to use; you simply plug it to your computer and start enjoying your music. I feel in love with this device at first glance, and who wouldnât? It is compatible with TV sets, Smartphoneâs, PCs and Pads. You can plug it to your computer and enjoy your music at any time. Though, not endowed with lots of features, the speaker is easy to set up and operate, this is perfect if you want something simple. You plug the USB cable into your device on the wall, plug the jack into your device and regulate the volume by rotating the volume control. You wonât have to waste any time on setup, just connect the speakers to your devices and fill the room with quality sound. This buddy will provide the right effect as you destroy your enemies on the battleground. 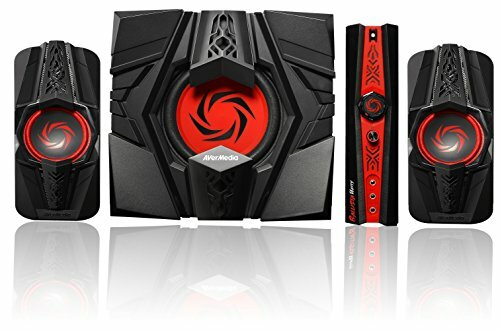 The Thunderclap 2.1 CH Gaming Speaker System a emits rich deep, solid sound quality for excellent bass performance and clear/detailed mid and high range frequencies for realistic sound. The sound system features a pulsating LED which is synchronized with the dynamic bass for realistic sound (the audio effects are so real, you feel like youâre in a real life battle). These 45âwatt speakers have the power to blow your mind and bring realistic sound to your movies, music and games. The sound system comes with multiple RCA and 3.5mm inputs that makes your music, movies and games sound better. Featuring satellites optimized for maximum reach, you can hear the sound in any corner of the room. Without the right sound, games will just be a bunch of cartoons jumping around the screen. This is why the manufacturers of the AverMedia Ballista Unity Gaming Speakers came up with this awesome set of speakers. Unity speakers are perfect for gaming and they heighten the gaming experience. The speakers prolong optimal sounds long after the game is finished. 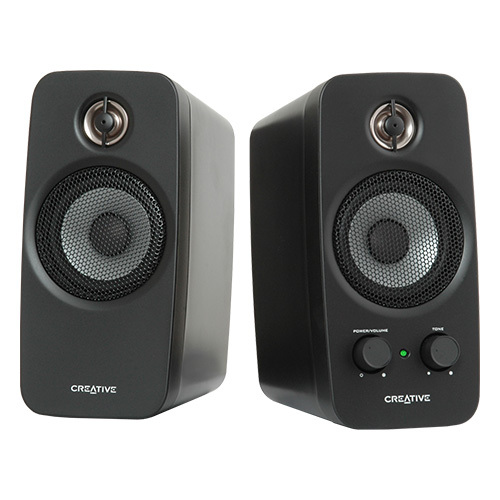 With these speakers, youâll experience crystal clear high frequencies and bass sounds with minimal distortion. This speaker takes gaming to the next level. First off, youâll have to think twice before seeing a horror movie with these speakers because you may just forget that itâs just a movie. The Logitech Multimedia speakerâs z333 deliver 80w peak power with a deep bass response that makes you feel as if you were in the TV or gaming arena. The set features a convenient wired control pod which makes it easy to control the volume and power, plus a headphone jack for private listening. You may also adjust the bass control with the turn of the subwoofer control knob. 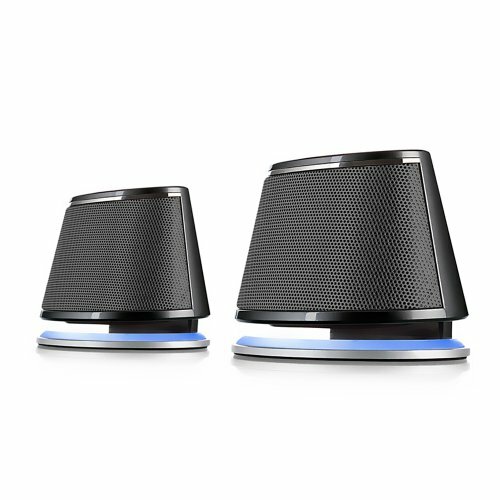 The speaker is compatible with computers, Smartphoneâs, tablets, television sets, game consoles and other digital devices. This is ideal for music and gaming enthusiasts. 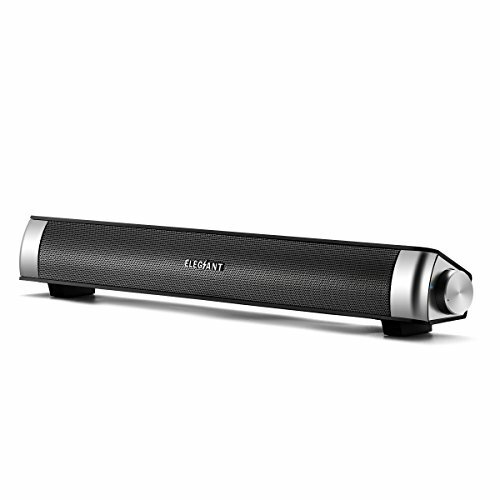 It features BasXPort technology that enhances the low frequency response without the use of a subwoofer. It comes with an easy access volume, bass and treble control located at the front, plus auxiliary headphone jack which makes the speaker system convenient. With this speaker system, you will enjoy balanced sound with dedicated tweeters for sharp, detailed highs and robust mid-range drivers for richer, fuller sound. You can connect the speaker to your PC, LCD TVs and other stereo audio sources. Though not the perfect speaker out there, The GigaWorks T20 Series II 2.0 Speaker is easy to set-up and doesnât lack in design quality. It will fit perfectly onto any desktop because it has compact speakers that produce quality sound. 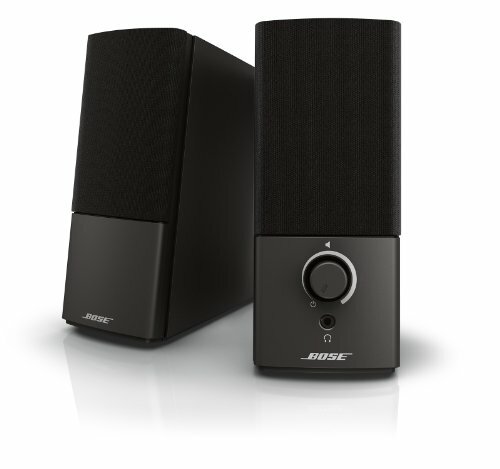 If youâre a movie, music or game lover, then you should try out Bose Companion 2 Series III multimedia speaker system. The speakers have a superb performance that surpasses the average speaker system, exposing you to a new world of entertainment oblivious to you in the past. It features two compact speakers that deliver the sound in details. Youâll enjoy your music and video more with the systemâs unique digital processing. Itâs amazing how the sound emitted from this sound system appears to reach beyond its scope. Youâll no longer hear music, videos and game audio; youâll feel the sound. Coupled with its amazing sound quality, the sound system also features a unique speakersâ ported cabinet design. This cabinet design features the volume control and headphone jack and an auxiliary input for external connection. Speakers are essential computer accessories. Youâll need them for maximum effects during gaming sessions, watching movies and off course they complement your PCâs in-built speakers as you enjoy your music. 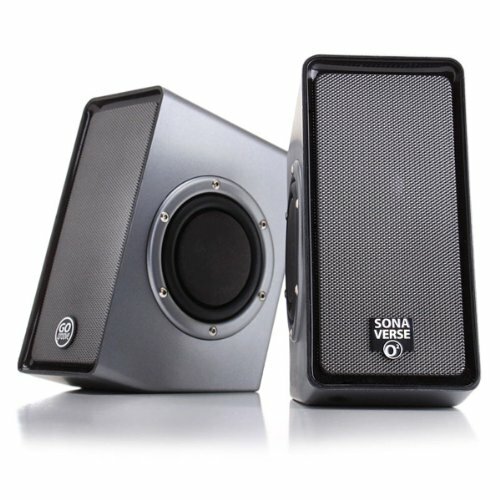 This is one very important aspect to consider when selecting speakers for your computer. You should go for something you can afford. There are lots of quality options out there and weâve even talked about a few in the article. Paying more for a speaker doesnât guarantee you the best. So you should consider the price properly before you go shopping. 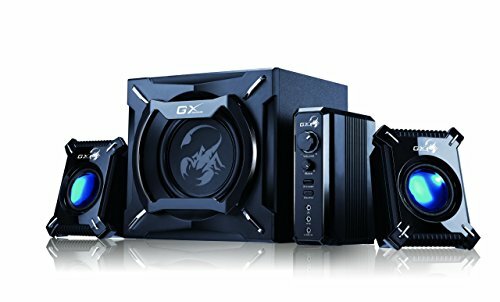 You want a speaker that you can connect to your PC, gaming console, TV set and other audio devices. A sound system with a few audio input options is ideal. There are times where you want to turn up the volume or bass to experience detailed sound but, the volume of your speaker may disturb your neighbors, so youâll want to be able to adjust this without much effort. A speaker system with a control knob will be a good choice. Your speaker should be able to it in your room. You donât want giant spaces that take up all the space in the room. You want something that can blend in easily. The design also counts, sleek is always better. Gone are those days when more speakers meant better sound. These days, less is preferred. Look for a speaker system that manages to deliver quality sound with a few speakers. When selecting speakers for your system, you should set your priorities right. Do you want to hear their battle cries as you destroy your enemies in the game or do you want the bass to fill up your room as you play your hip hop jams? Youâll need to take these into consideration before going to the market. Go for reputable brands, you donât have to drift through the customer reviews in search of the perfect speaker system. Weâve done that already, check out the brands weâve compiled for you and make your choice. Best of luck as you choose the right set of speakers for your sound delight.